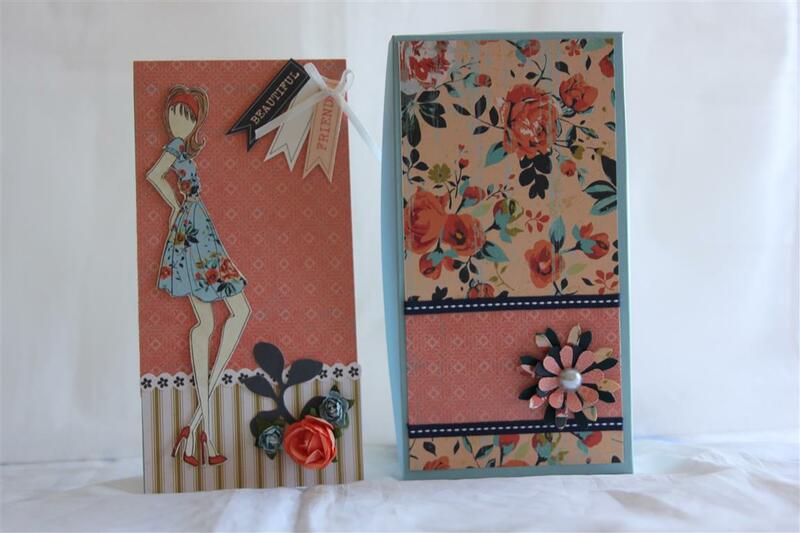 I used some more of the kaisercraft spring bloom paper collection to dress my Prima Doll stamps.I love creating cards with these stamps, and they always look different depending on the colours I use. I also used some of the collectables from the collection, and some fussy cut flowers. the butterfly on the second card is a prima butterfly. Very hot here today, very lazy day! til tomorrow….. This is my other Prima Doll stamp, and I teamed her up with some Simple stories Fresh Air patterned paper.I used quite a lot of kaisercraft rhinestones, some ribbon and stampin up card stock.I have really enjoyed making these doll stamp cards, and hopefully this weekend I get some time to experiment some more with them.Til tomorrow…. Very quick post tonight as tea is cooking as we speak … vereything is the same as last nights post – just a different doll stamp! 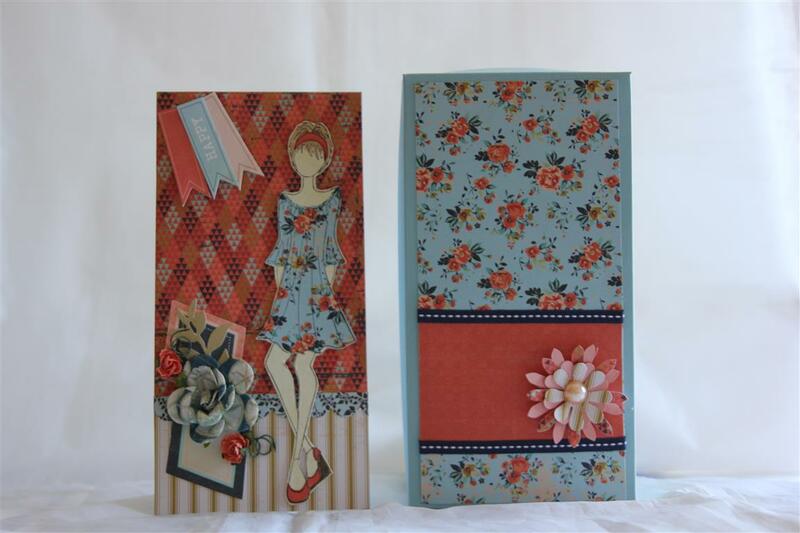 Kaisercraft velvet crush paper and collectables, and prima doll stamp Cardstock is stampin up. 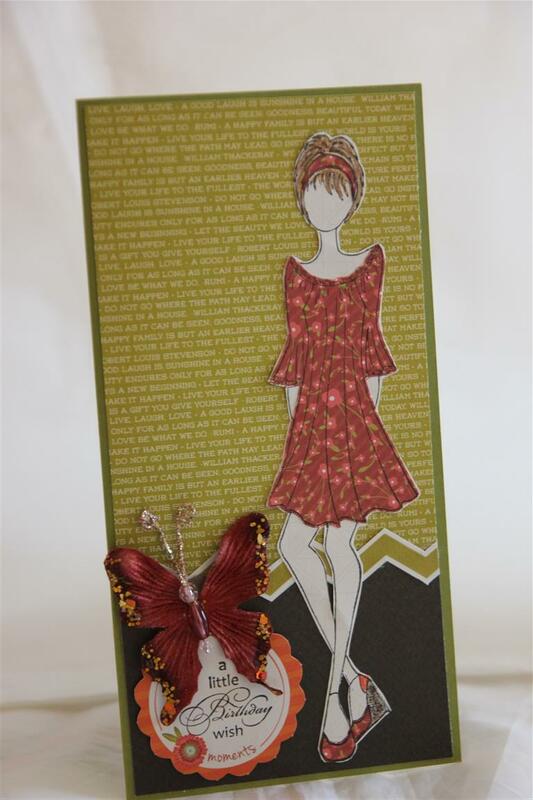 til tomorrow…..
Julie nutting prima Doll Stamp and Kiasercraft velvet crush. 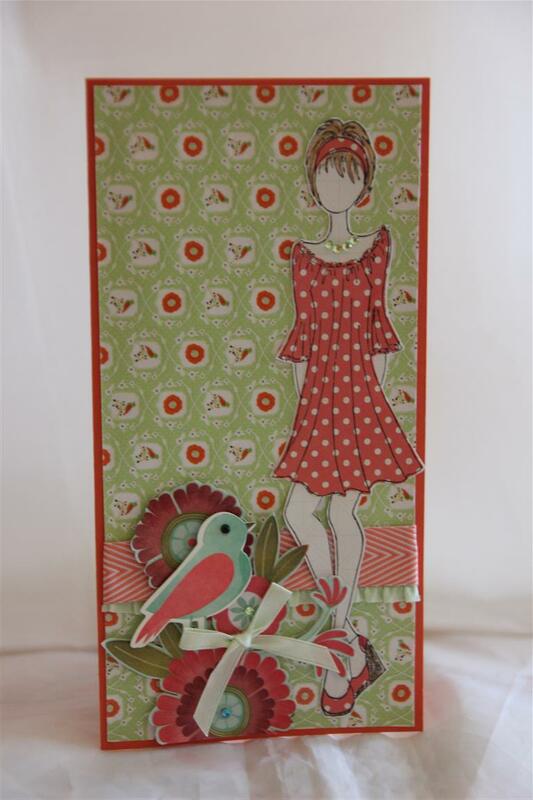 I keep coming back to Kaisercraft Velvet Crush paper and collectables, but here I have teamed it up with my Julie Nutting Prima Doll stamp. 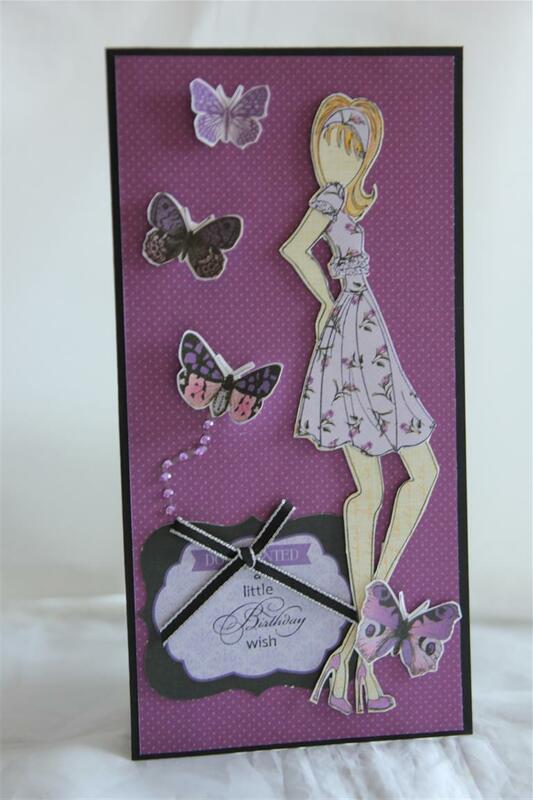 I stamped the image on some websters pages paper that had the right colour for skin tone, and stamped it again on some velvet crush, and paper pieced it all together. That way all I had to colour was the hair. I am still learning the colouring technique, and here I used prismacolour pencils.These stamps are large so I made a bigger card – 21cm x 21 cm and then folded in half – that is called a DL size, and the envelopes are readily available ( they are the same size as those rotten bills come in! )i have another one to show tomorrow.Til tomorrow…. I promised myself I wasn’t going to get hooked on the prima doll stamps by Julie Nutting, but.. oh well whats a girl to do? Although I do colour, I much prefer to use these stamps with gorgeous patterned papers, so the only thing I coloured was the hair. 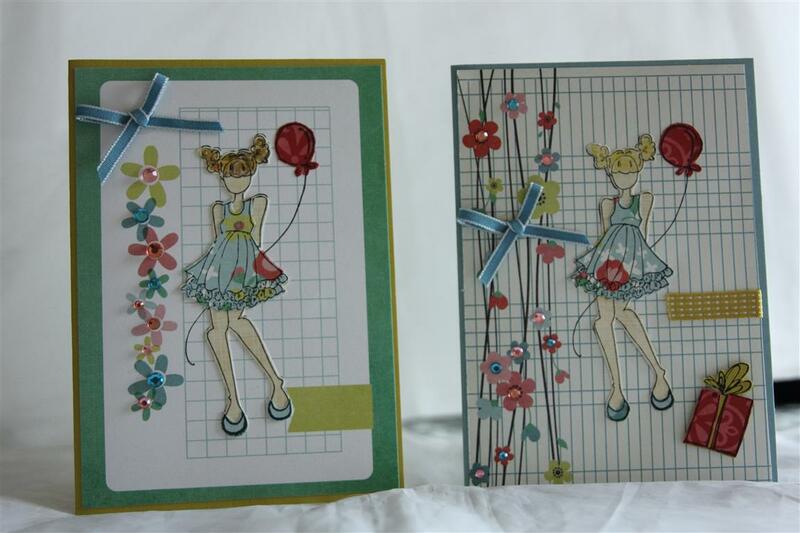 the rest has been stamped onto patterned paper and paper pieced together. 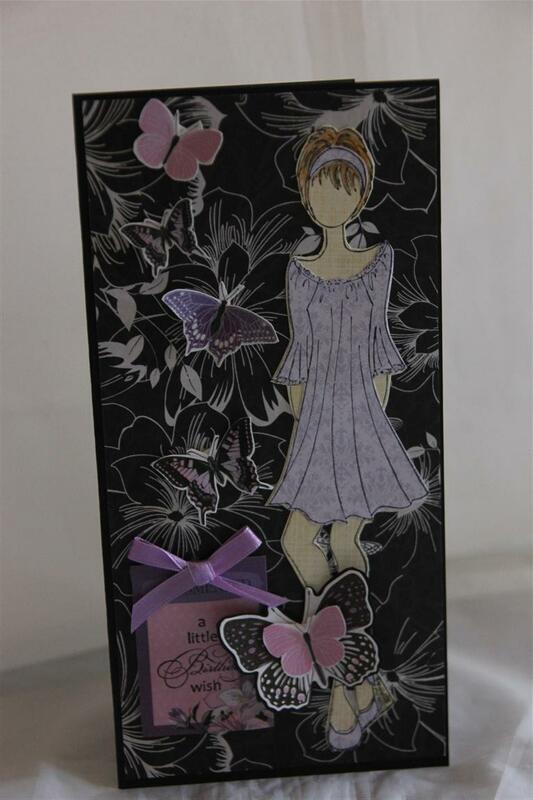 the paper I used on this one was Kaisercraft Velvet Crush, and for the skin tones i used an old sheet of websters Pages that I had filed away.most paper collections that are released have one sheet that would be suitable for skin tones, so this plan should work for me all the time!the butterflies are from the sticker sheet that was released with velvet crush,and I added a ribbon bow to finish. I taught a very busy class this morning and was grateful to a very dear friend for her help with a lady new to cardmaking, without her help I would have had a class that severely ran over time!I bought a big bag of goodies after class, and can’t wait to sit down tonight after tea and have a good look at what I picked up. Til tomorrow….